I'm waging war in three lands at once. In Icehedge, the cruel and unforgiving ice land where I've taken my exile, I've got dragons on my doorstep and few troops to defend against the onslaught. See, most of my troops are stationed in White Shades, a land of death and marshes, where I've been fighting a war of attrition with a horde of zombies. And the few who've made it out of White Shades have their hands full in Mapan. As pretty as the jungle land of Mapan is, it's infested with sea serpents that pick off my poor archers with ease. It's a long road to the top, if you want to enter Ardania. 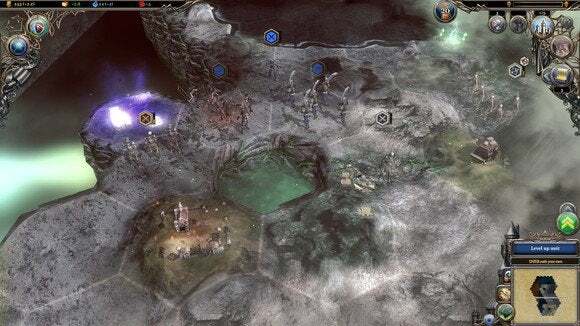 Warlock 2 is a fantasy-themed 4X game (part of this year's Age of Wonders III/Warlock 2 double punch) where you take control of a Great Mage, wizard in exile. You've decided to make a stand against the tyranny of your fellow wizards, and so you've established a city in a faraway world. See, Warlock 2 is played out on multiple maps at once, all held together by teleporters. And I don't just mean two or three maps. You start, as I said, in exile—as far from the seat of power as is possible. You'll have to battle your way across seven or eight intermediary worlds to make it back to the center again and reclaim the title of Head of the Council of Great Mages. Those worlds have their own factions, so you'll encounter (for instance) an empire that stretches across four different maps. The worlds of Warlock 2. That's a heck of a supply line to defend. 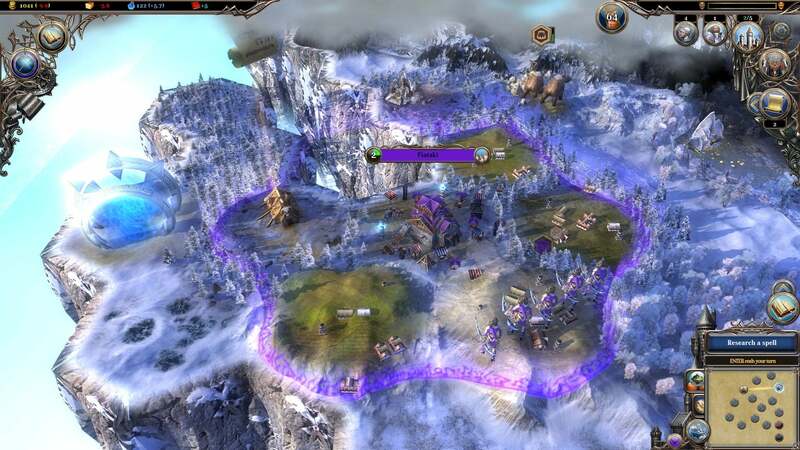 It's easy fodder for legendary moments, as your troops fight off multiple threats at once and expand your dominion—which is good, since conquest is the only win condition available. And while navigating between the various maps is a bit clunky at first, I was soon swapping between my different domains with ease. That's no small feat. Warlock 2's multi-map system is confusing enough in theory that it could've derailed the entire game. 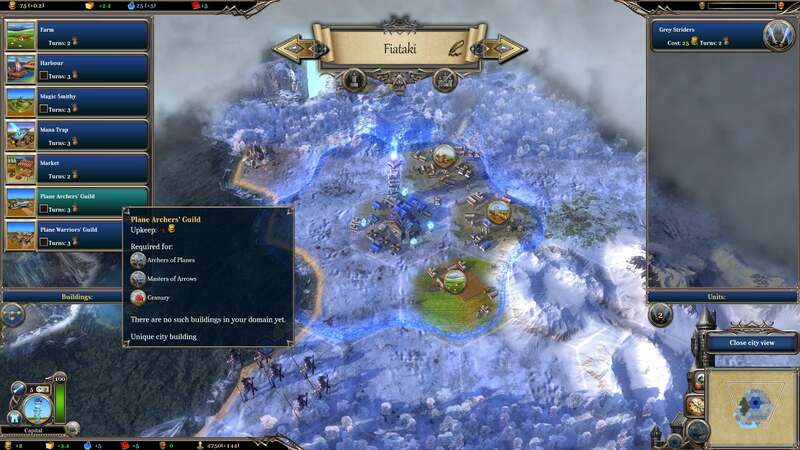 In some strategy games, it's hard even to keep track of your units on a single map, let alone six maps at once. But if Warlock 2 has a strength, it's in presenting you with the information you need to rule your lands effectively. 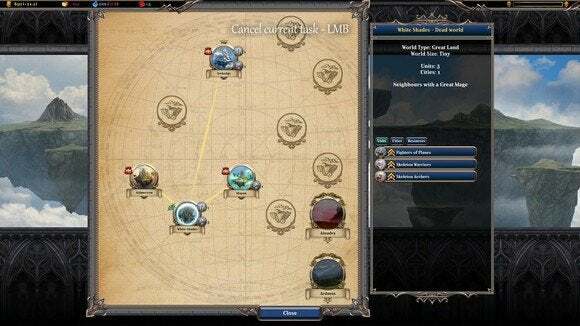 The game provides you with a list of all your troops and what map they're on, for example—no need to keep mental tabs on that ultra-rare unit you squirreled away in a corner of some map. Warlock 2 keeps tabs on it for you. Not TMI, just the right I. In fact, presentation is where Warlock 2 excels. The game's got the light, cartoon humor of, say, Warcraft III but still plays like a serious 4X contender. It's easy to get a game going and progress through the first few worlds, but the game will punish you for overextending too early or neglecting your diplomatic options. For a game that seems fairly simple and lightweight up front, there's quite a bit going on. The way Warlock 2 handles religion is one of my favorite systems in the game. You can align with one of the various deities, reaping the benefits. Doing so, however, will make another god hate you. You have to navigate the various benefits of alignment and decide when to take the risk—if ever. Warlock 2 is fantastic at allowing you to feel like you discovered some new strategy by making obvious every tool at your disposal. Playing Warlock 2 reminds me of playing Civilization for the first time. I could jump into the game with absolutely no idea what was going on, play for a few hours, conquer a few cities, do okay enough to have a fun time, and learn for myself what made the game tick… and then probably get steamrolled, start over, and do a bit better the second time having learned what to avoid. That's not to say Warlock 2 lacks depth. 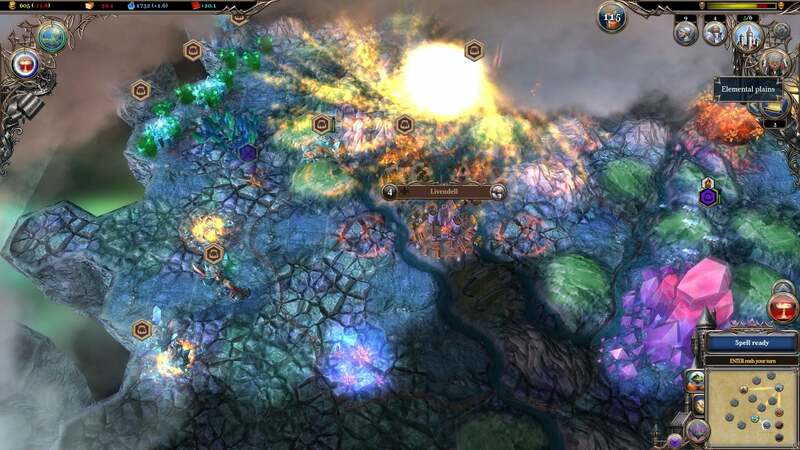 There's a lot to learn—how to maximize special resources, or research the best spells. But it's all presented to you in such a friendly way, you don't mind making those early mistakes or taking that journey. Don't get me wrong: Warlock 2 isn't as good as whichever Civilization game you consider your favorite, nor is it a timeless entry in the 4X genre canon. Outside of the multiple-map system, I don't think the Warlock series does much innovative—certainly not enough to freshen up what's largely a stale genre. And it does even less to distinguish itself from its predecessor, outside of an extra layer of polish over the proceedings. That said, it's just plain fun. 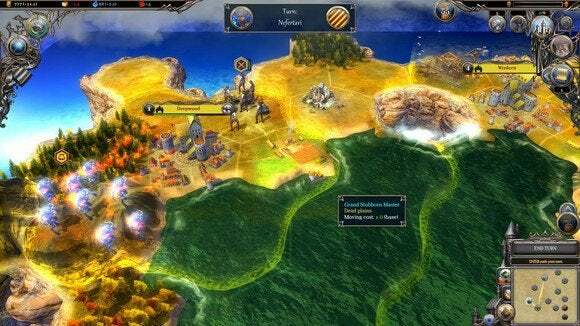 If you're new to 4X games I'm still going to recommend you just stick to Civilization—why settle for second best? Warlock 2's fantasy humor serves as a great hook for folks who find Civilization a bit dry and historical, though. Sure, it's not the deepest turn-based game on the market, nor is it the most polished. But as an extremely streamlined, presentable 4X game? One that's friendly to newcomers while still retaining adequate depth for 4X veterans? Warlock 2 handles itself expertly.